After a long ride in the back of a pickup truck through the deep forests of Guatemala, we made it to our hostel near Semuc Champey, where we had planned to do a cave tour. This is probably one of the best things to do in Guatemala! “Do you think we need shoes?” I asked. I wore my swimsuit, shorts and a tank top with trekking sandals and packed my waterproof bag with bug spray, a towel, my camera (Go Pro is much more convenient for caving than any other camera) and a flashlight. There were about 7 people in our group, we all said our hellos and waited for the guide, who then told us we would be swimming and instructed us to strip down to our swim suits and take nothing with us into the caves, not even shoes. So much for my backpack. He gave us a short introduction, explained that we needed to be very careful, watch out for cutting our feet on the rocks and expect it to take around 3 hours. He then handed us each a lit candlestick and we were off. 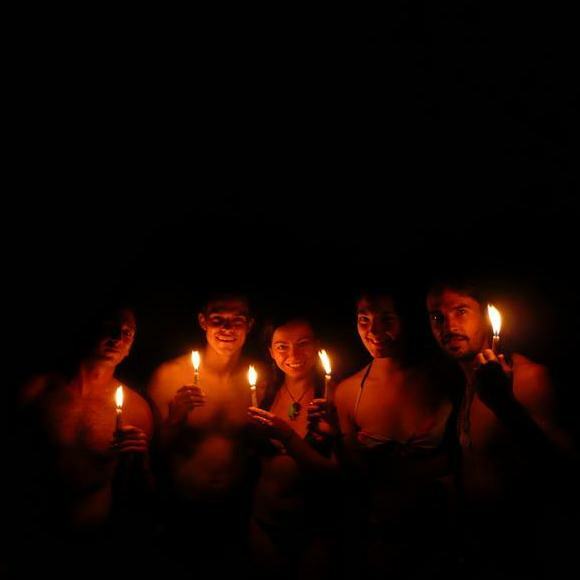 We entered the cave network, holding our candles and I was surprised to be immersed in water up to our waists within just a few meters inside. After the first turn around a corner, the caves immediately became pitch black. We came upon our first obstacle, a steep and jagged rock face with a small opening at the top, twelve or so feet above us. “You hold them, watch me.” The guide scrambled up the wall with minimal effort and looked back at us expectantly. This seemed nearly impossible. We were barefoot, climbing slippery rocks with one hand and no protection or anything to hold on to, but I was feeling adventurous so I went first. My heart was beating out of my chest while everyone watched. The rocks hurt my feet and I had to stop mid-climb to switch hands holding the candle. There was a steady flow of water trickling down the cliff, making everything very slick and if I fell, it was a certain death. There was no where to go but up. Adrenaline pumping furiously through my veins, I made it to the top where the guide smiled and patted me on the back. He pointed to the tiny opening, about the width of my hips and gestured for me to climb through. I peered through and braced myself to climb down what I had just climbed up, but this time through a small tunnel. I made it to the large pool at the bottom of the rocks and swam around, holding the candle above my head and waiting for the rest of the group. I could hear them struggling, the girlfriend of the couple was stuck on the ledge having a panic attack and wouldn’t move. We continued to follow the cave network, up and down steep rock faces, squeezing through tiny tunnels that led into deep pools below. We were getting deeper and deeper into the caves, with nothing but the sound of our voices, dripping water and the occasional bat swooping by. All the while trying to keep our candles lit because if they went out, that was it. Two hours later, we made it to the literal light at the end of the tunnel, physically exhausted, high on adrenaline and with a new sense of camaraderie and accomplishment among the group. Letting out huge sighs of relief, we headed off to watch the sunset over a beer.